"Praying the Holy Rosary is like a breath of fresh air"
How To Pray The Rosary Everyday was created to encourage you, the average person to pray the Rosary everyday, enabling you to find peace and serenity in your life. Simple table of Rosary mysteries and days they are prayed on during ordinary time. Even on the weekend and especially on Sunday morning you may experience this familiar rush. Do you worry and feel anxiety some or most of the time? You don't need to live life this way, and God doesn't want you to either. Yearning For Serenity In Your Life? keep your hearts and minds in Christ Jesus." We are all yearning for a little serenity in our lives and none other than Jesus is the teacher of this elusive state in life. Start meditating on the life of Jesus, and you will find that serenity. This website will help you achieve that level of peace by teaching you how to pray the Rosary. Basically all the Rosary prayer is is a meditation on the life of Jesus, which are called Rosary Mysteries. By praying the Rosary everyday you will find peace amid this busy, worrisome world. It's very easy to say the Rosary everyday, and hopefully this website will inspire you to pray this beautiful Rosary prayer by teaching you how to say the Rosary. In order to educate and support others in praying the Rosary, we strive to create an intimate and warm Rosary Community. One of the features of this community is an effort to introduce and support Rosary Promoters - people out there promoting the Rosary either by their homemade rosaries and rosary jewelry or their ceaseless efforts to spread devotion to the Rosary in any varieties of ways. If you are out there promoting the Rosary and would like to be considered for How To Pray The Rosary Everyday .com's "Rosary Promoter Of The Month" feature, please contact us and let us know of your efforts! 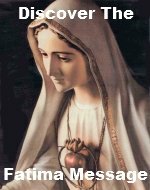 FREE Rosary Booklets! 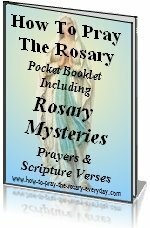 - completely FREE downloadable Rosary booklets! for your heart, mind and soul. These aids are here to help lift your prayers to an even loftier plane. And they will allow you to learn more about God and the relationship He longs to have with you and those you love. and how easy it is to say the rosary." How To Pray The Rosary Everyday was also created with the curious in mind, who want to learn more about the Catholic Rosary. You've seen pictures of a rosary, people praying the Rosary, and even rosaries used as jewelry. You were always curious about it, but maybe you were afraid to ask what is the meaning of the rosary beads because you didn't want to offend anyone. Maybe you've heard negative things about the Catholic Rosary prayer. How To Pray The Rosary Everyday was created with you in mind. Here you will find all the information you need about the Rosary and how to say the Rosary with a Catholic Rosary prayer guide, which is learning to develop a deep relationship with God and how to pray to God and meditate on the events in the Redemption of mankind. You can learn about what the Rosary is from this website and why Catholics pray this beautiful prayer about the life of Jesus. Hopefully the mystery behind those beads will be solved for you after learning more about this Catholic Rosary and how to do the rosary prayer. in every place. The Lord be with you all." Most of all, learning how to pray by just taking the time to pray the Rosary everyday is the first step to becoming friends with Jesus and finding inner peace and serenity. If you pray and meditate about the life of Jesus everyday, you will become quite close to Him and the peace only He can give, will permeate your life even amid your hectic schedule. How To Pray The Rosary Everyday is here to get you on your way to achieving that peace you are searching for while you get to know Jesus so much better. Return from How to Pray the Rosary Everyday homepage to our Rosary Prayers page.